Your pets are important to you. We totally get it. That's why we're a full-service veterinary medical facility, ready to provide the best possible care for all of our furry friends. 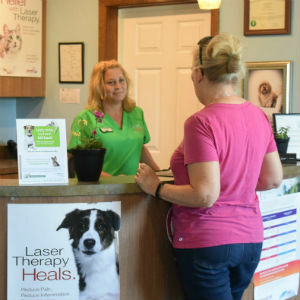 Our professional and courteous staff are committed to promoting responsible pet ownership, preventative health care and health-related educational opportunities for our clients. 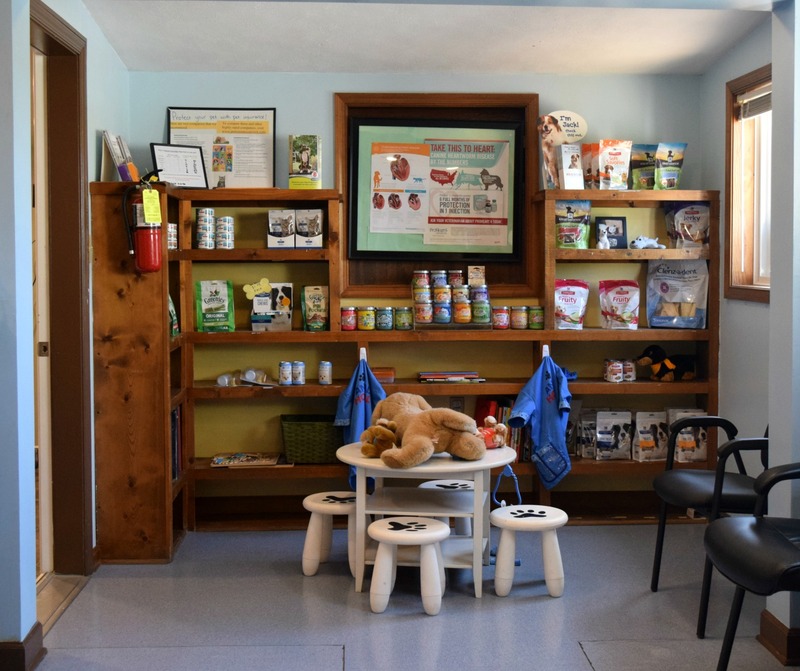 The American Animal Hospital Association (AAHA) is the only organization to accredit companion animal veterinary hospitals in the US and Canada. Only 12-15% of veterinary hospitals in the United States and Canada are accredited by AAHA. 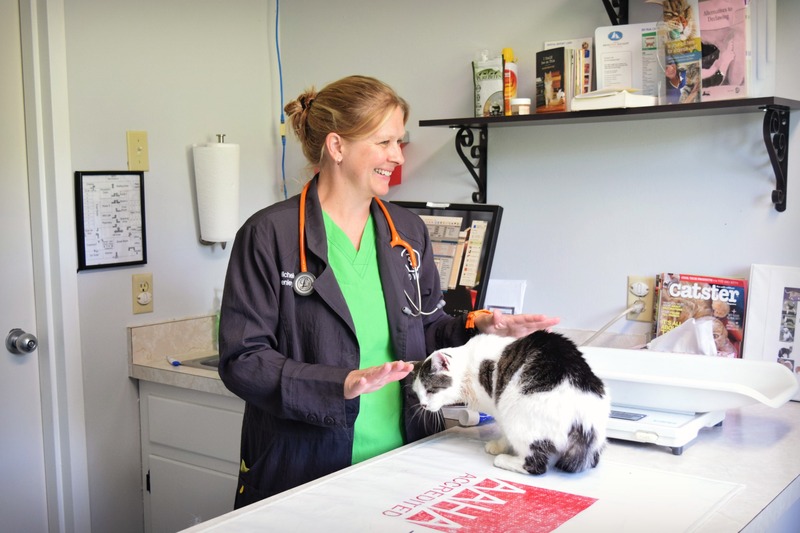 Being accreditated means that we hold ourselves to a higher standard, and that your pet is receiving care at the highest standards in veterinary care. 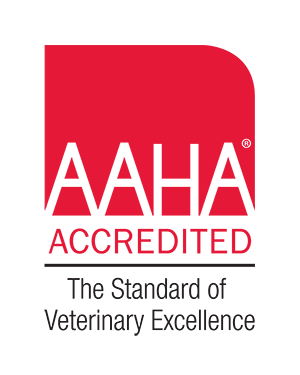 Every three years, AAHA sends a consultant to evaluate our adherence to the AAHA Standards of Accreditation on approximately 900 different standards of veterinary care. And the Animal Clinic of Rockbridge is the only clinic in the greater Lexington area to hold this accreditation. Dr. Schenley doing a feline wellness exam. Christie manning the front desk. Barbara weighing an orange tabby, Homer. Dr. Bailey and Melissa performing a dog neuter. Dr. Schenley drawing blood from a cat. Play area for the kiddos. Dr. Bailey and Linda performing a cat neuter. Providing the best care always boils down to having the best people. And we've got some of the best to care for your beloved pets. 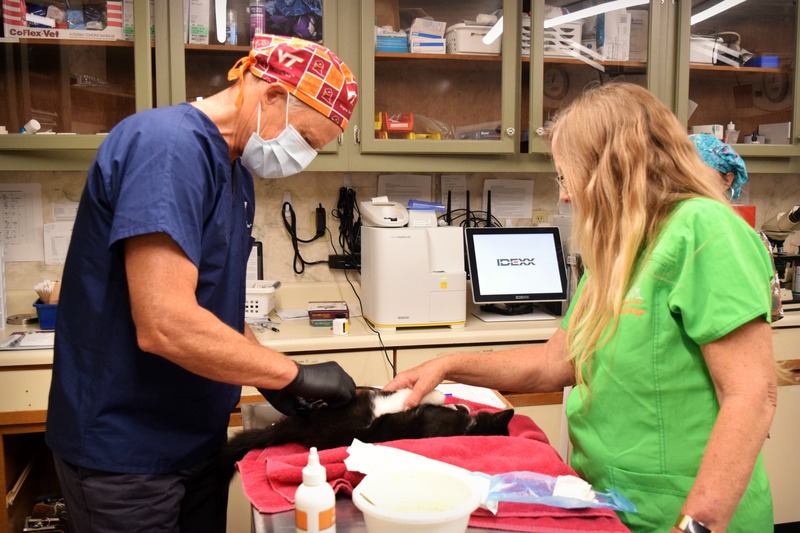 © 2019 Animal Clinic of Rockbridge. All Rights Reserved. I was born and raised in a small East Tennessee town called Oak Ridge. I went to the University of TN for both undergraduate and vet school. I graduated from the University of Tennessee College of Veterinary Medicine in May 2003. I moved to Rockbridge County in 2004 and have lived here ever since. My husband Chip and I have 2 wonderful children and a number of four legged children. I am so excited to be a part of The Animal Clinic of Rockbridge team! I attended Washington and Lee University receiving a BS in Biology in 1978. I then earned a Master's Degree in biological sciences from Drexel University in 1979. I wisely married Gail in 1980 and together we have been living happily ever after for 38 years. We have raised 6 daughters and 2 sons. I taught high school math and science for 15 years. 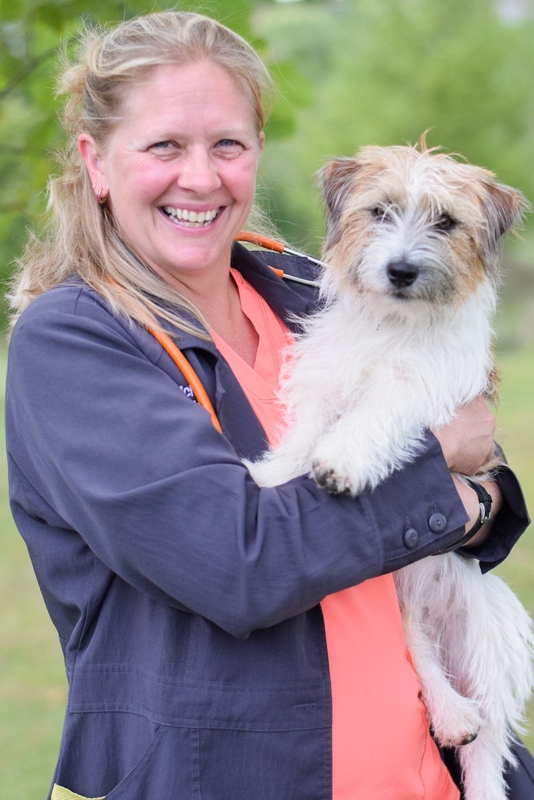 I received my Doctor of Veterinary Medicine degree from Virginia Tech in May 2000 and have been at the Animal Clinic of Rockbridge since, sometimes as an associate veterinarian and sometimes as the practice owner. I enjoy reading, swimming, bike riding and time with my family. I have been with the Animal Clinic of Rockbridge since 2007. I became licensed as a veterinary technician in 2008. I am married and have 2 daughters and 2 dogs. I enjoy all aspects of veterinary medicine but am especially interested in anesthesia and behavior. I love getting to know our clients and enjoy recognizing them around the community. When not working, I like to read or be outside gardening or playing! I recently moved back to Rockbridge County after living in Colorado for more than 20 years. I am still in the process of remembering directions on how to get to various places and county landmarks. I became an LVT in 2014 and like all animals, but especially cats and senior pets. My favorite thing to do is spend time with my family, which includes my partner, son, one cat and one dog. I am a bit of an introvert who is very fond of reading nonfiction books, hiking with my dog, gardening, Indian food, and amateur meteorology. I am a proud member of the Cloud Appreciation Society. 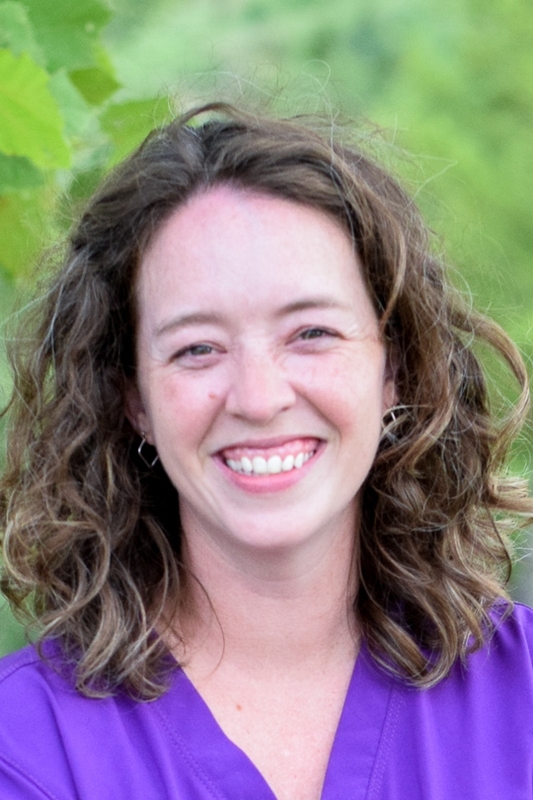 I am a Rockbridge County native and have been serving pets and their owners here at the clinic for 3 years. I live with my husband Greg, 3 of our 6 children, 3 dogs (Fuzzy, Poochie, and Tyson), 2 cats (Tikki and Tootie), 1 guinea pig (Snookie) and a Beta Fish named Poptart. I love getting to know our patients and clients, and I feel very blessed to be working with such a warm and welcoming team. I moved here 13 years ago with my family to enjoy the small town life. I own a small "hobby farm" with my husband and son. We have a dog, cats, and a few horses. In my spare time I enjoy teaching Zumba exercise classes. I am glad to be part of The Animal Clinic of Rockbridge team. 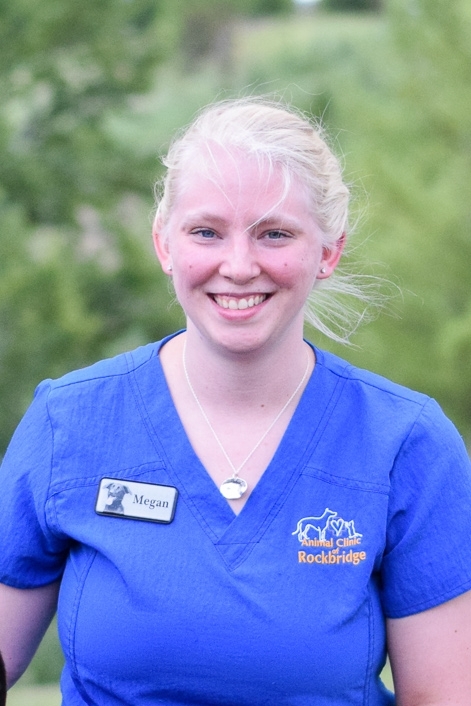 I started working at the Animal Clinic of Rockbridge in March 2018, after deciding I wanted to take a job in the veterinary field. I graduated from Rockbridge County High School in 2015. In my free time I love being outdoors, doing crafts, and spending time with my animals. I have 2 dogs named Dom and Willow, and a cat named Gypsy. I live in Stuarts Draft, Virginia. I have two French Bulldogs, Stella and Maggie. I also have an outdoor cat named Kit Kat. I've always loved animals and I have wanted to work in the veterinary field ever since I was little. In high school, I enrolled in a Small Animal Care class at Valley Tech and I recently earned my certification in veterinary assisting from Animal Behavior College. I completed my externship for the vet assisting course at the Animal Clinic of Rockbridge and was fortunate enough to be offered a position to work with them once my schooling was completed. In my spare time I enjoy going to my husband's races and camping with my family and my frenchies. We strive to prevent illness whenever possible. 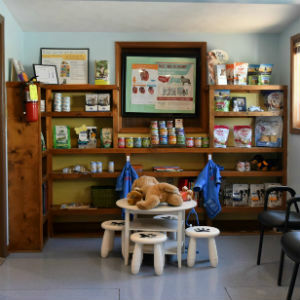 The time and effort invested in wellness care has rewards for both pets and owners. 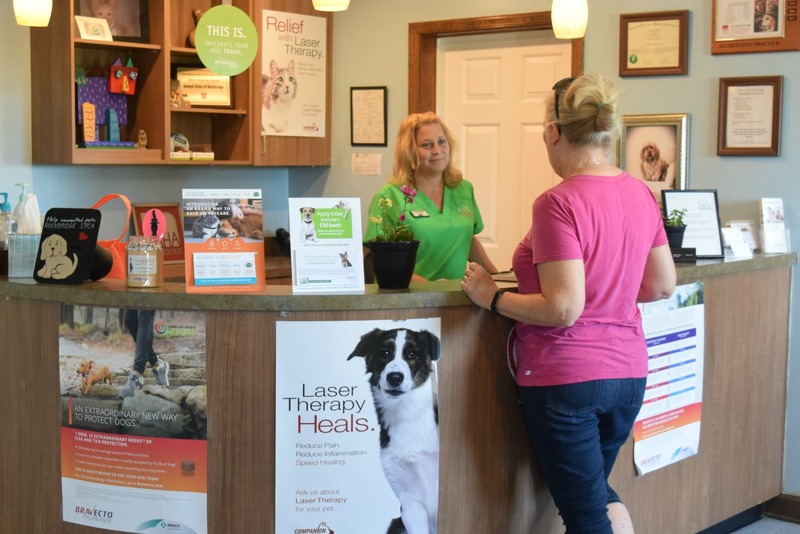 Wellness care is designed specifically for each individual patient and should include: Comprehensive physical exam, internal parasite testing, heartworm and flea/tick control, vaccinations, spay and neuter packages and specialized blood tests for all life stages. The Fear Free mission is to prevent and alleviate fear, anxiety, and stress in pets. There are many things that occur at a veterinary hospital that can be very scary and stressful to our patients. 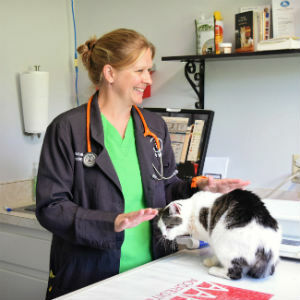 Our Fear Free Certified Doctor is dedicated to trying to make veterinary visits as pleasant as possible for all involved. This includes using calming pheromones in the rooms, positive reinforcement, a little extra time and TLC, and if needed, medication. Please ask us for more information about Fear Free! We offer routine surgical care. All patients are carefully screened with an exam and blood work performed prior to surgery. 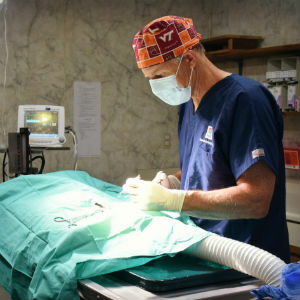 Anesthetics are specifically tailored to your pet and any problems he/she may have. All surgical patients have an IV catheter in place during surgery and are given IV fluids during the procedure. 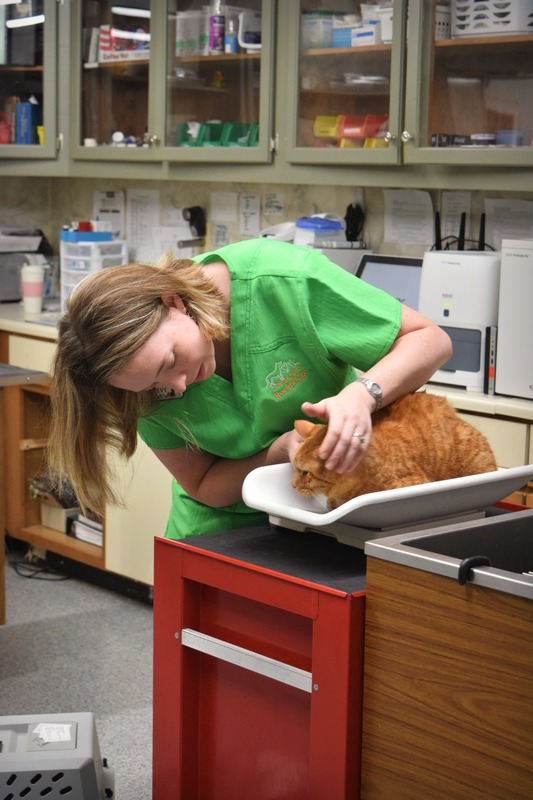 Our licensed veterinary technicians closely monitor every patient's blood pressure, ECG, heart rate, respiratory rate, and oxygenation the entire time they are under anesthesia. Regular professional cleaning is important for maintaining your pet's teeth. We use modern and safe ultrasonic scalers to clean each tooth thoroughly - above and below the gum line. Our technicians polish teeth to create a smooth, lustrous tooth surface more resistant to plaque buildup. Fluoride treatments help strengthen enamel and reduce tooth sensitivity. We also have a state-of-the-art digital dental x-ray machine in order to see what is happening under the gum line where the majority of dental disease occurs. All pets need a good quality, balanced diet. Some pets require special food. Our trained and certified staff is available to help you choose the right diet for your pet to keep them happy, healthy, and active. Our staff can also help you do body condition scoring of your pet. We can then help you set up an ideal feeding plan and exercise program in order to keep your pet at their appropriate weight. Pets are our four-legged children - we feed, nurture, and lavish attention on them. Our highly qualified animal caretakers do the same when your pets are with us. We provide tender loving care and long walks to keep them happy and active. All dogs must have proof of current rabies vaccine, DHPP, Bordetella, Influenza, and Intestinal Parasite Exam. 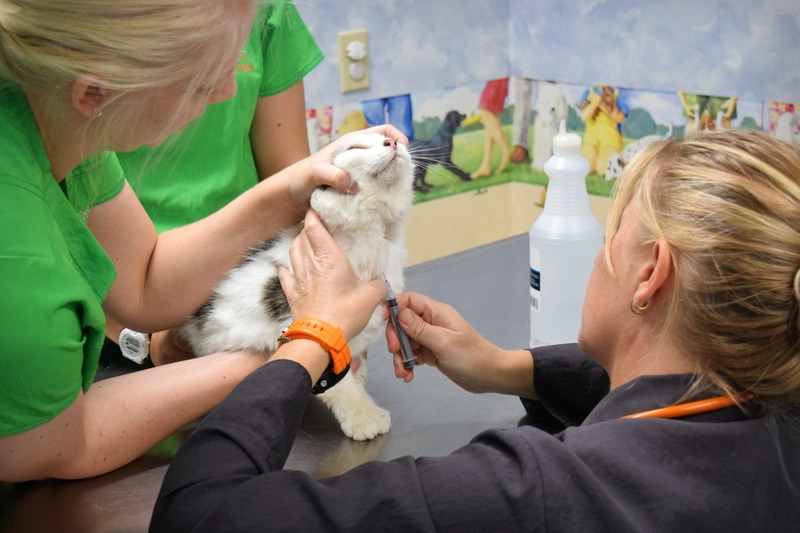 All cats must have proof of current rabies and FVRCP vaccines in order to board with us. This ensures that all of our friends are protected during their stay. We offer house calls for some of our services. 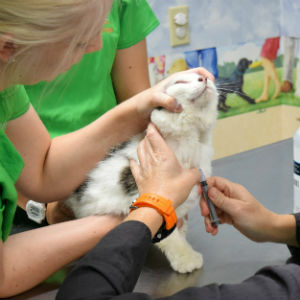 We know coming to the doctor's office can be scary, so sometimes having procedures done in the pet's own home can make things easier. 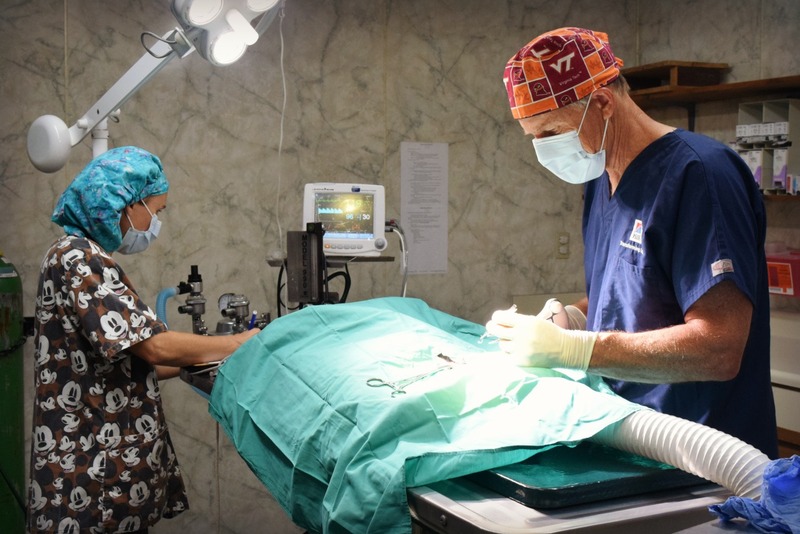 There are some procedures that we cannot do at the house (surgery, radiographs, ultrasound, and dentistry for example) but we are happy to come out for more simple procedures such as exams, vaccines, hospice care, and euthanasia. Saying goodbye to a long-time friend is painful. We work with clients to ensure their pet's comfort and dignity as they approach the end of their lives. Hospice care and euthanasia can be performed either here at the clinic or at your own home where your pet is the most comfortable. Radiographs - or x-rays - help our veterinarians evaluate musculoskeletal, cardiovascular (cardiopulmonary), gastrointestinal, reproductive and urinary systems. We have digital radiology and a separate digital dental radiology machine to use for teeth. Ultrasound is a non-invasive, state-of-the-art technology which uses sound waves to painlessly examine specific internal organs, primarily the heart and abdominal organs. Ultrasound is also used to diagnose pregnancy in dogs and cats. We offer cold laser therapy (called photobiomodulation) that can be used for anything that causes pain/inflammation (any disease process that ends in "itis"). The is a cutting-edge therapeutic option that is used by many professional athletes to help speed healing from injuries and relieve pain. Cold laser therapy isn't like the laser you see in a photocopier or the laser pointer professors favor in lecture halls or even like the lasers that are used for surgery. The Companion therapy laser system sends photons, or packets of light energy, deep into tissue without damaging it. These photons are absorbed within the mitochondria of the cells and induce a chemical change called "photo-bio-modulation". This light energy then inspires production of ATP in the cell. ATP is the fuel, or energy, cells need for repair and rejuvenation. Impaired or injured cells do not make this fuel at an optimal rate. Increased ATP production leads to healthier cells, healthier tissue, and healthier animals. If your pet is feeling pain, has inflammation, or a wound, the laser is a pain-free, surgery-free, drug-free treatment. The laser is used to treat a variety of injuries, wounds, fractures, neurological conditions, numerous dermatological problems, arthritis and pain. Whether your pet is rehabilitating from trauma or injury, healing from wounds, or simply aging. Laser therapy has been shown to provide relief and speed healing. This website answers many common questions people have about laser treatment. Physical Therapy is commonly done in human medicine but has been sadly lacking in veterinary medicine. We offer a wide variety of physical therapy tools such as exercise balls, wobble boards, treadmills, as well as our therapeutic laser. Our trained doctor and staff can help get your pets back to 100% after an injury or surgery with the use of physical therapy. In addition, we offer weight loss exercise plans and exercise plans for older dogs to help keep them in shape. We have an in-house pharmacy with a large selection of medicines readily available. In addition, we have an online pharmacy. You can purchase your pet's medication and have it billed and shipped directly to you through our online store. Our online pharmacy is much safer than other well- known online pharmacies due to the fact that we can promise that you will never get any counterfeit products. In addition, manufacturer rebates are available on our online pharmacy which can save you even more money. Because the products are purchased through us, the product guarantees are all in place which is untrue for other online pharmacies. Microchips have helped reunite thousands of pets with their families and we strongly recommend it for all dogs and cats. Our microchips are one of the most widely used brands and also meet the requirements for international travel. This increases the chances of a safe recovery if your pet is ever missing. We offer emergency care during our regular business hours. After hours, we use the services of several, fully staffed emergency clinics These clinics are used not only for emergencies but also overnight care of critical patients.